Update:7:30 pm- thanks for all the assistance Wendell and Nora Flow have been found safe and have been reunited with their family. 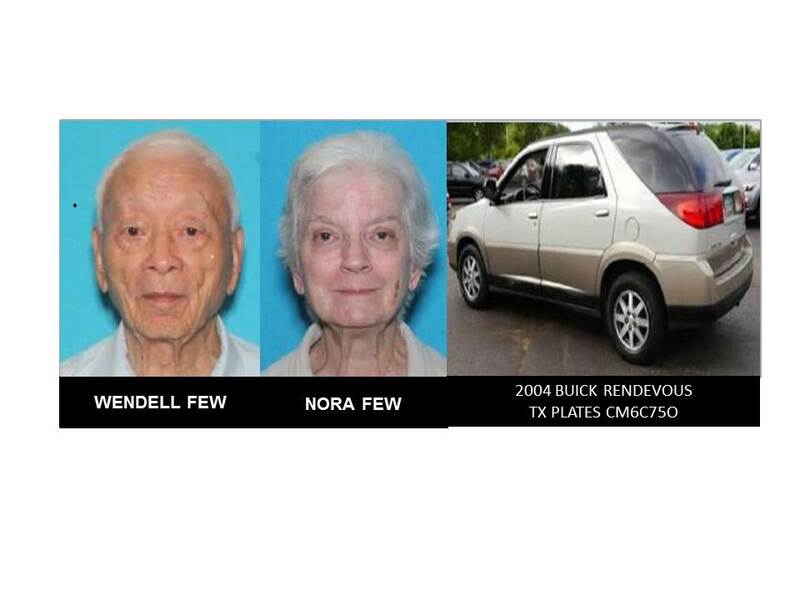 The Conroe Police Department is searching for Wendell Few, diagnosed with a cognitive impairment, Asian, male, 99 years old, DOB 06/26/1919, height 5’ 9”, 160 LBS, gray hair, brown eyes. The Conroe Police Department is searching for Nora Few, diagnosed with a cognitive impairment, white, female, 81 years old, DOB 10/09/1937, height 5’ 5”, 150 LBS, black hair, brown eyes. The senior citizen was last seen at 8:00 PM, 12/16/2018 in Conroe, driving a white/beige, 2004 Buick Rendevous with TX license plate CM6C750. Law enforcement officials believe this senior citizen’s disappearance poses a credible threat to her own health and safety. If you have any information regarding this missing senior citizen, contact the Conroe Police department at 936-522-3200.